Airblast sprayers are precision tools that must be kept in good operating order to ensure proper spray quality. The daily sprayer inspections (discussed here) can be considered a form of “preventative” maintenance since the operator will (hopefully) find small problems before they become big problems. The diligent operator should also follow a regular sprayer maintenance schedule throughout the season, according to the sprayer manufacturer’s recommendations. It’s very much like having your car serviced every 6,000 kilometres, except in this case, sprayer maintenance schedules are often associated with the number of working hours. Many sprayer operators are guilty of ignoring their airblast sprayers and babying their tractors; don’t neglect your sprayers! This used Myers sprayer was imported from Europe by a vineyard in Prince Edward County, Ontario. Many European countries require regular sprayer maintenance inspections before the operator can use them. 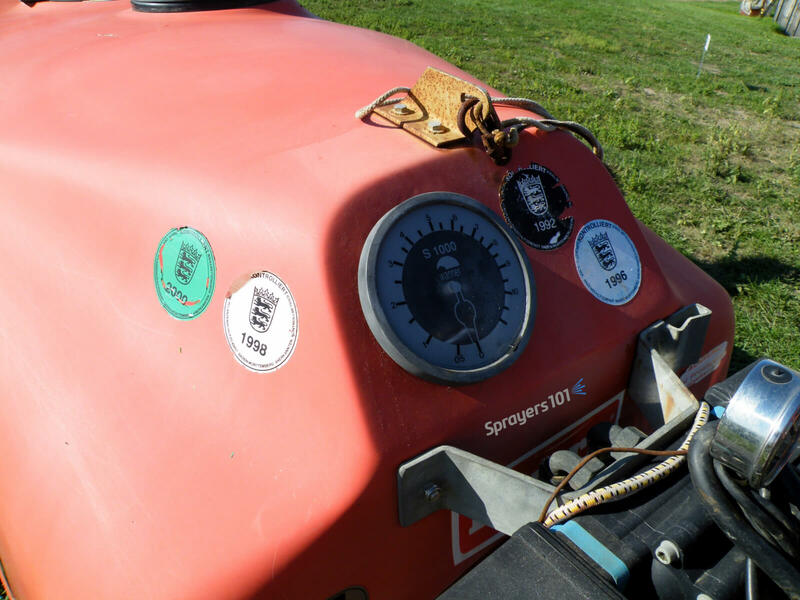 The stickers on this sprayer show that it was maintained and calibrated correctly. In certain countries, sprayers that are not compliant are “grounded” until the issue is remedied, and the owner is charged a hefty fine. We don’t require this level of compliance in North America… yet. We’ll restrict our discussion to Pre-season maintenance (i.e. the first start up after long-term storage). 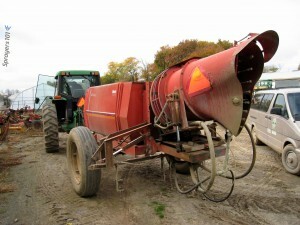 “Winterizing” the sprayer (i.e. preparing the sprayer for long-term storage) is covered in another article. If the steps outlined here differ from the manufacturer’s recommended practices, go with the manufacturer; your warranty may depend on it. Never assume that just because you followed the manufacturer’s winterizing instructions that your sprayer is ready for immediate hook-up and use in the coming season. Parts seize, scale breaks away from surfaces, and small beasties sometimes choose to eat, or make their homes, in cozy sprayers. Plan to spend at least half-a-day per sprayer. It may not take that long or it might take longer. Pressure gauges snap off, fittings crack, welds might need repairing and bearings seize. Be sure you have a plan to get replacement parts before you start. After buying a new-to-me three point hitch GB sprayer, I ran a pre-season maintenance inspection. I was assured it was winterized correctly before it was stored. However, every nozzle body was packed with what looked like wet chewing tobacco. I still have no idea how it got in there, but I’m guessing a lack of appropriate filtration was a big factor. Get to know your new sprayer. Read the operator’s manual and the manufacturer’s specifications to understand what the sprayer is supposed to do, and what it’s not supposed to do. Loosen, lubricate and re-tighten the gear clamps to ensure they last. Always back them off a bit first before tightening them to avoid stretching them. Apply light gear oil to the PTO telescope. Follow all the hoses and use a paint pen to number the hose ends with the corresponding connection. Now you’ll always know where they go. Apply thread release (aka ‘never seize’) to all the bolts. A lubed bolt or stud should never release easily. If it does seize, put the nut or bolt back on and clean the thread to avoid damage and try again. Visual checks of secure nuts are made possible using a paint pen. Use a torque wrench (not impact tools) when replacing nuts and remember to read the manufacturer’s specifications to ensure they are tightened correctly. Never extend a torque wrench handle with a pipe and don’t hold them anywhere but on the knurled handle or they won’t be accurate. Use a paint pen to draw a line across the nut, washer and chassis. This creates a means for a quick visual check for loose nuts. The anatomy of a generic, but fully-loaded, airblast sprayer. Newer sprayers have all these features and more. If this is a sprayer that’s been in long-term storage (e.g. winterized), then following these steps will help prevent costly breakdowns, inconsistent spray application, and may increase the lifespan of the sprayer equipment. 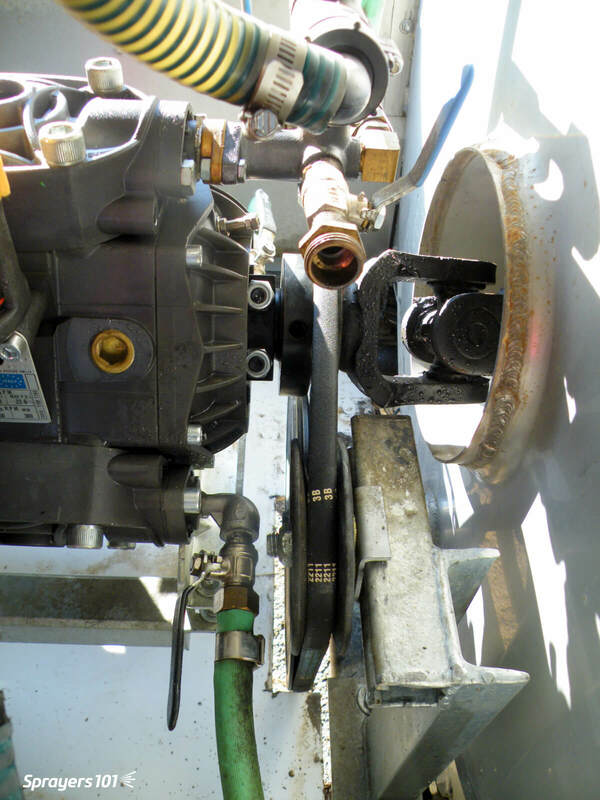 One of the most common causes for faulty pump performance is “gumming” or corrosion inside the pump. Get into the habit of flushing the pump (and the entire system) with a solution that will chemically neutralize whatever you sprayed that day. This will dissolve most residues remaining in the pump and leave it clean for each use. With filters and nozzles removed, fill the tank with clean water and pump it through the system until the discharge is clear of dirt, sludge or scale that might be present in the tank, pump, and hoses or lines. The discharge should be clear – not cloudy. There’s always residual liquid in the lines – wear chemical-proof gloves! Once the system is flushed, lubricate and check the pump. 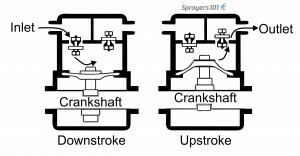 Maintenance for pumps is pump-specific. The sprayer operator’s manual will give detailed instruction on how to care for yours. Sprayer pumps can be divided into two categories: Positive Displacement Pumps and Non-Positive Displacement Pumps. 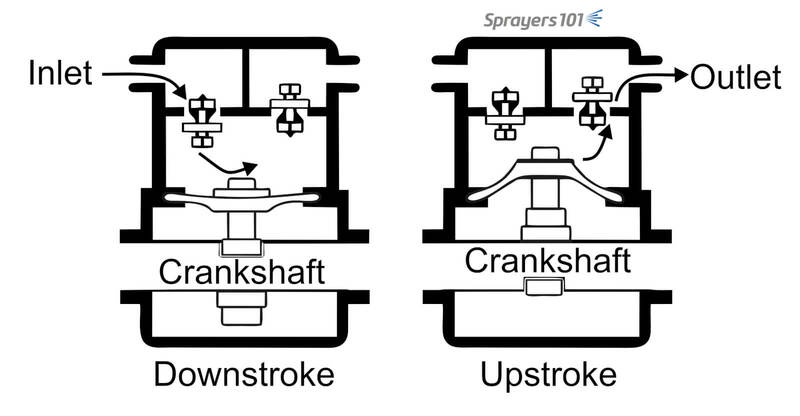 There are three types of sprayer pump commonly found in Ontario airblast sprayers. This is a Piston. These include Roller, Diaphragm and Piston pumps. They are self-priming and traditionally operate at “high” pressures. Flow from these pumps is directly proportional to the pump speed, which is why they require a relief valve and bypass line between the pump outlet and the nozzle shut-off valve. Roller pumps are the most popular pump with farmers world-wide, but I’ve never personally seen one on an airblast sprayer. 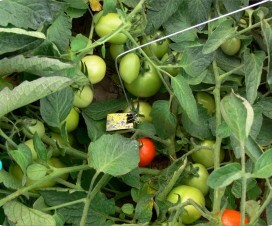 The seal and roller materials should be selected based on their compatibilities with the pesticides. 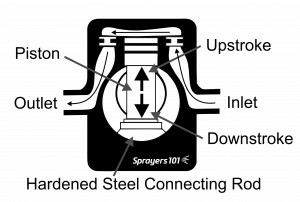 There are three types of sprayer pump commonly found in Ontario airblast sprayers. This is a Diaphragm. Diaphragm pumps are compact and popular for use with abrasive and corrosive pesticides. 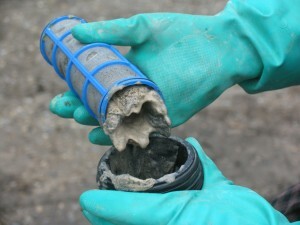 Their oil-filled piston chambers protect the pump materials. These are commonly found on airblast sprayers. HyPro recommends changing oil after 40 hours of break-in operation and every 500 hours after that. The diaphragms should be replaced every 1,000 hours. Generally speaking, EPDM (black) diaphragms are a better choice for airblast sprayers, while the Desmopan (amber) diaphragms are really for lawn care sprayers. Piston pumps are similar to car engines. They are relatively low-flow and high-pressure and suited for use with handguns sprayers. The piston cup materials should be selected based on their compatibilities with the pesticides. These are commonly found on airblast sprayers. Sometimes the pump may be referred to as a “piston-diaphragm” pump, combining features of the two. 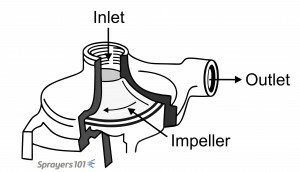 There are three types of sprayer pump commonly found in Ontario airblast sprayers. This is a Centrifugal. These include Turbine (or Transfer) and Centrifugal pumps. They must be primed and traditionally operate at “low to medium” pressures, although there are models available that can go up to 190 psi. Flow from these durable pumps comes from a rotating impeller that feeds liquid through the lines instead of pumping per stroke. 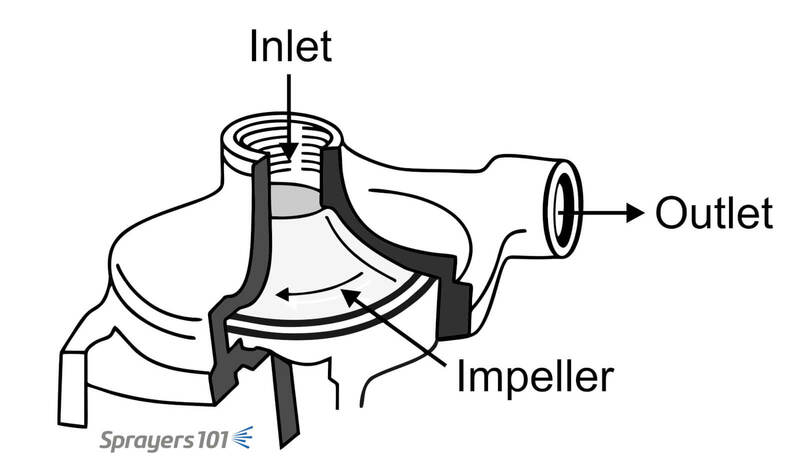 Therefore, if the outlet is closed, the impeller spins harmlessly, so a relief valve is not needed. Centrifugal pumps are found on many airblast sprayers in Ontario, but I don’t often encounter them anywhere else. The lack of a pressure regulator valve and the difficulty separating PTO speed from pressure make it more difficult to match the sprayer to the target. Corrosion is the big concern, here. If the sprayer was winterized correctly, it should have been cleaned and flushed with a 50% solution of antifreeze with a rust inhibitor. The ports should have been plugged after to keep air out. Unplug them before running them clear. 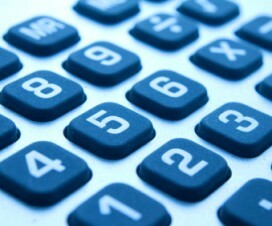 You can learn about selecting a pump in this article. Photos of three sprayer pumps that have been cut away to expose their inner workings. Under-sized hoses and fittings and splices can severely reduce the capacity of any pump. 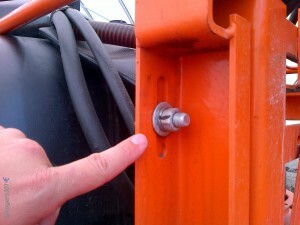 Suction hose diameter should be at least as large as the pump intake opening. Examine all hoses and connections for cracks or leaks while under pressure. Avoid splices where possible. Inline filters shouldn’t look like this. This was a serious tank-mix incompatibility issue. Do you clean yours at the end of every spray day? Photo Credit – M. Lanthier, British Columbia. If you don’t already have three levels of filtration (including the tank-opening basket) then consider slotted (not mesh) strainers behind the nozzles. 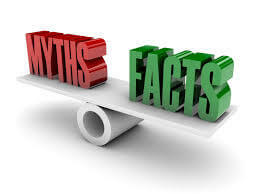 If you don’t use them because they plug up, then look to your agitation system: If there is sludge in the sump at the bottom of the tank when you’re done spraying, then you’re not mixing and/or agitating your spray solution properly. This will lead to a gummed pump and clogged strainers and nozzles. 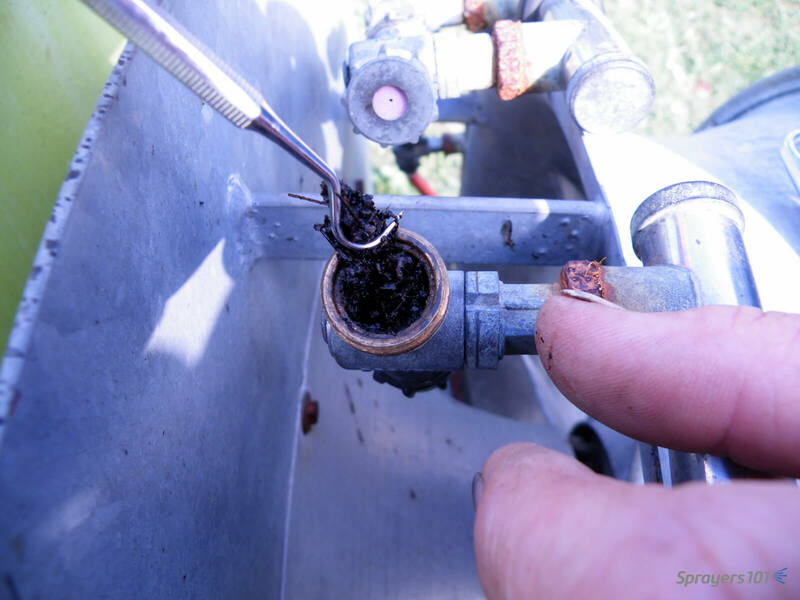 It may also be your sprayer hygiene: you should be cleaning strainers and nozzles after every spray day. Remove slotted or mesh nozzle strainers and scrub them with a bristled brush because flushing will not clear them. This plastic ‘sight glass’ indicates how full the tank is. They become opaque and unreadable in a season or two, but they’re very easy to replace. Can you see through yours? 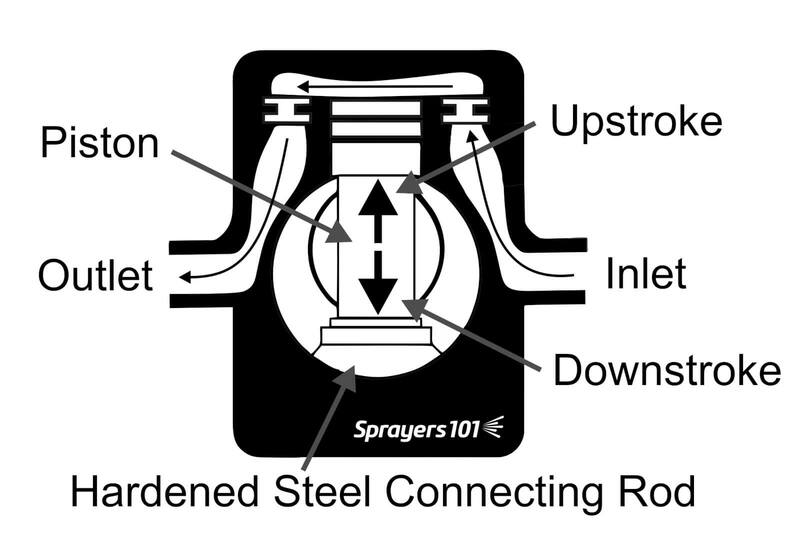 The relief valve on your sprayer should always be in the bypass position during start-up. If your gauge spikes then the gauge may always read high afterwards and should be replaced. Likewise, an opaque or leaking gauge should be replaced. Replacing old gauges improves sprayer performance considerably. 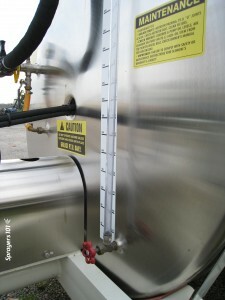 Be sure to use the oil-filled variety of gauge to eliminate a bouncing needle. You can also get suppressors that fit between the gauge and sprayer to prevent pulsing. Consult the article on testing airblast pressure gauge reliability. Gauges should be rated twice as high as your highest operating pressure. For example, if you typically spray at 150 psi, have a gauge rated up to 300 psi. That way, you can see small changes in pressure more clearly. Plus, if your needle is pointing straight up, you know your pressure is approximately correct. At minimum, check the tire pressure. Hard tires drive faster, but leave compacted ruts. Soft tires drive slower, but disperse weight better. Airblast sprayer wheel assemblies should be cleaned and inspected as part of regular annual maintenance. Wheel bearing maintenance before long-term storage may prevent water from corroding the bearings. Check the belt alignment. If the belt is not exactly true (i.e. in line), it will not operate efficiently and may wear out more quickly. Check all belts for wear, proper tension and to ensure they are true (i.e. perfectly aligned). This ensures that power is transmitted efficiently. Universal joints seize and break more often than you think. Check and grease them regularly. Grease the PTO splines and tubes (often) and clean the connection zones. 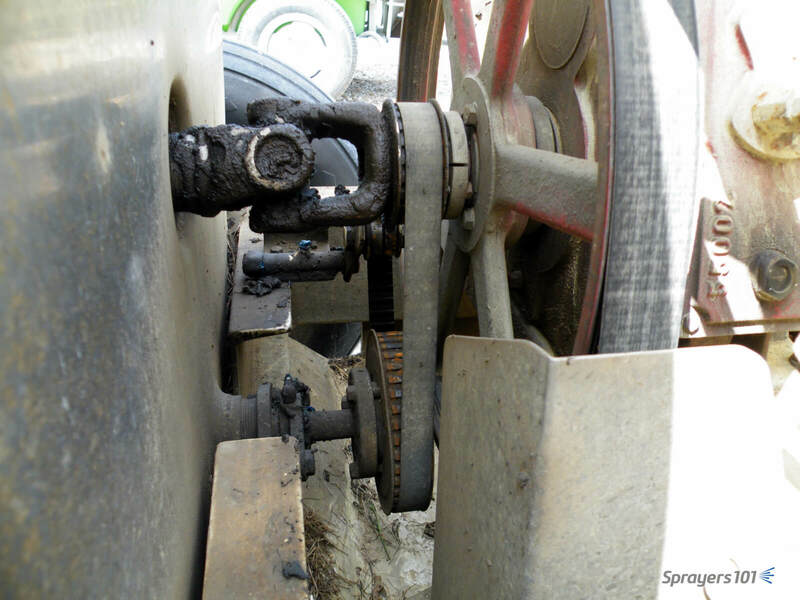 When the sprayer is hitched to the tractor, the PTO should be level and to prevent vibration and strain on turns. Never operate the sprayer without a shield in place! Many spray materials do not mix well and one of the common causes of uneven application is poor agitation. 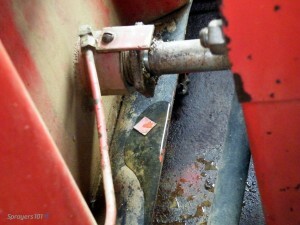 If you find deposits at the sump in the bottom of the sprayer after an application, your agitation is insufficient. For mechanical agitators, check for propeller wear and ensure paddles are secure on the agitator shaft. Learn more about agitation here. If the agitator shaft is leaking a little, tighten the packing. The packing gland is a common source of leaks. Keep it properly greased. If a leak occurs you can usually repair it by tightening the bolts on the packing gland by ½ a turn, but if that doesn’t work you may have to remove and repack (or replace) it. A dirty grill. Make sure to clean sprayer equipment thoroughly, but avoid using a pressure washer which can drive grease out of sealed bearings. Photo Credit – M. Waring, British Columbia. A leaky mechanical agitator – a little is alright, but a lot means you have to tighten or even repack the gland. Check the propeller blades for any nicks or cracks that could imbalance the propeller and produce vibration. They should be scraped clean to remove any accumulated residue. Tighten the bearings, lubricate the moving parts, check for loose bolts and broken brackets and clean the trash guard, if present. Ensure that the fan entrance grill is securely in place and has not been punctured or damaged. Growers have reported that installing bottom deflectors prevents the fan from stirring up dust and leaves. 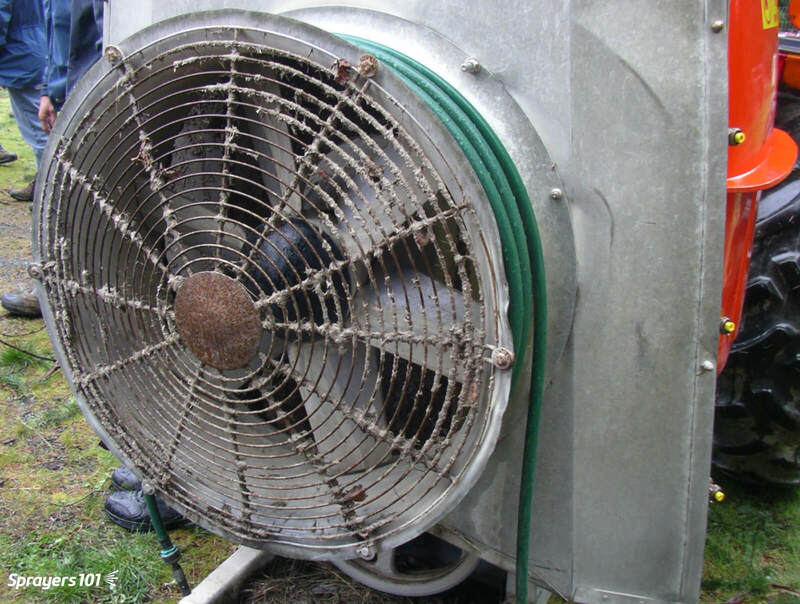 This has reduced the caking on the fan blades and protects adjacent plants from possible physical damage. 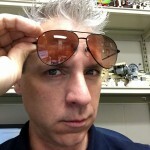 Learn about adjusting air direction here. Airblast sprayers, such as this John Bean, come in many forms. They may not match all of the maintenance steps listed here, but they all benefit from regular attention. Nozzles require far more than can be included in this article. There are lots of articles to read on the topic if you follow this link. Pre-season is an important opportunity to ensure nozzles are performing as intended, so see the article on diagnosing nozzle output. In the case of conflicting instructions, always defer to the manufacturer’s instructions for maintaining the sprayer.